Two residents from Luton have incurred fines and costs totalling nearly £2,000 following successful prosecutions for breaching a Community Protection Notice (CPN) in relation to waste disposal. On 3 July 2018, Mr Gavin Persand of Links Way Luton incurred a fine totalling £979 for the offence of failing to comply with a Community Protection Notice to remove waste from his garden. This included the fine of £660, costs of £250 and a Surcharge of £66. The CPN was served as a result of complaints being made about Mr Persand storing mattresses and other waste in the front garden of the property. On 3 July 2018, Mr Nadeem Aslam of Cromwell Road, Luton, incurred a fine totalling £979, which included the fine of £660, costs of £250 and asurcharge of £66, for the offence of failing to comply with a Community Protection Notice to remove waste from his garden. 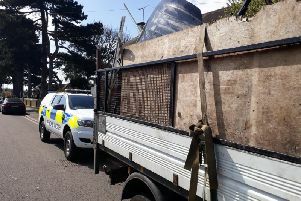 Mr Aslam was storing tyres, black sacks, mattresses and UPVC window frames in the rear garden of the property, as witnessed by the Neighbourhood Enforcement Team and received the CPN as a result. Both men failed to attend or contact the court in each case and a 14 day Collection Order was made. Councillor Aslam Khan, Portfolio Holder for Place and Infrastructure, said: “We hope that these prosecutions send a very strong message that we will always take robust enforcement action in cases like these. Residents also have the option of using an independent waste carrier to take bulky items away, they can check they are registered on the Environment Agency website . >To report waste problems, as well as log any other issues you’ve seen across the town, visit www.luton.gov.uk/myaccount to register and report a problem.